It’s been raining in Port Places – 23.8mm this week at North Wharf. Rain making its way down the kerb and channel, creeks and drains into the Yarra River carrying a burden of stuff that hasn’t been securely stowed in rubbish bins. Some comes to rest on the banks of the Yarra under the Westgate Bridge. The tideline is a mess of reeds tangled with packaging, cigarette butts, and plastic bottles – too much to pick up all of it. So I focus on polystyrene because of the way it disaggregates into its constituent balls which may then be eaten by birds or fish. 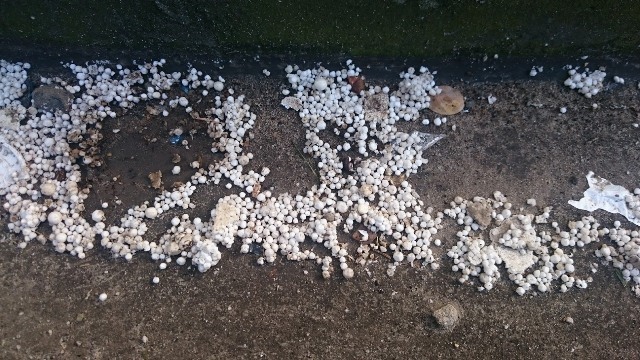 Polystyrene in blocks, in chunks, in aged brown shapes, and crumbled like rice cakes into soft smooth balls wedged inaccessibly amongst rocks. Expanded Polystyrene Australia explains that polystyrene is manufactured in three steps, the first being that ‘Upon contact with steam the pre-foaming agent found within the beads (usually a hydrocarbon such as pentane) starts to boil and the beads are expanded to between 40 to 50 times their original volume.’ The other two steps are explained on their website. Being 95% air, polystyrene travels easily by wind and water. 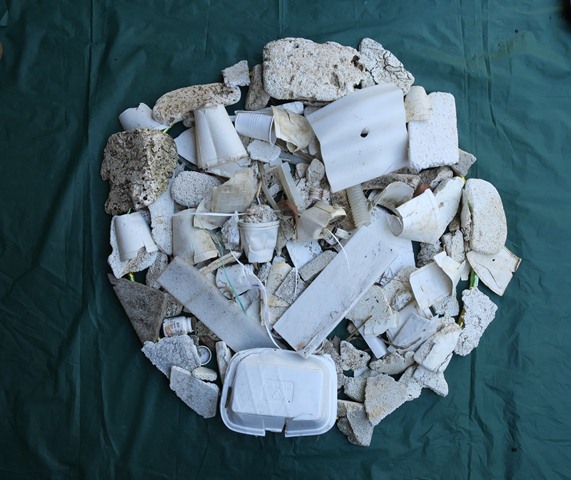 It is recyclable but locally the City of Port Phillip says the company that used to recycle the polystyrene it collected has closed down. Polystyrene has been banned in New York City, in Los Angeles, in Portland and in Washington DC. There are alternatives to using polystyrene. In almost every case it is used only once. Artist Carolyn Cardinet responds to these troubling matters with ‘elegant visual poetics’. 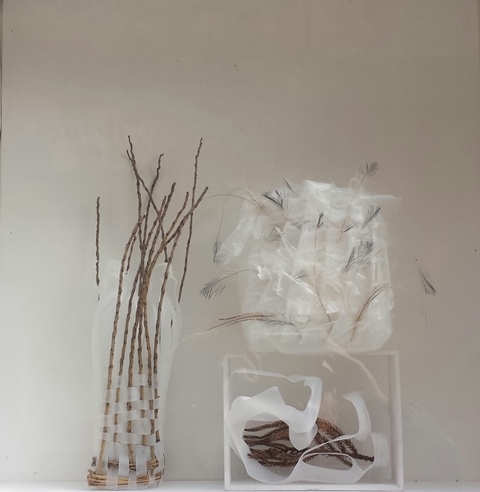 Gleaning materials from her surrounding environment, weaving waste and nature, she finds arresting ways of expressing that ‘tension between our natural world and our society consumption-al abhorrence’.